Photo courtesy of jabert on Panoramio. 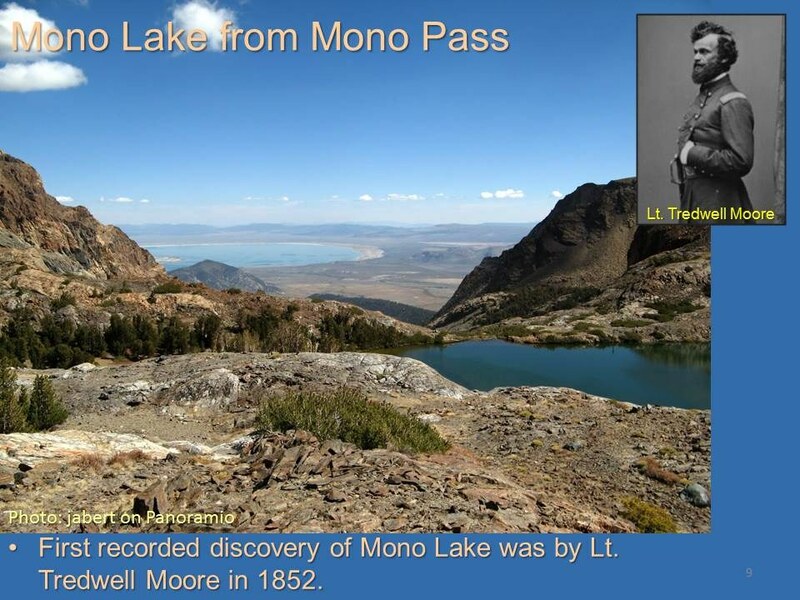 The first recorded discovery of Mono Lake was by US Army Lt. Tredwell Moore in 1852. Lt. Moore and members of his detachment became the first European Americans to discover the Mono Basin. The army was in pursuit of Chief Teneiya's Yosemite Miwok after a group of Indians attacked and killed three prospectors on the headwaters of the Merced River. The pursuit led them to Mono Pass for their first glimpse of Mono Lake. A Checklist Flora of the Mono Lake Basin, Mono County, California and Mineral County, Nevada. : Walker Lake. definition of Upper Mono Basin. Other photos about Geography - Mono County, California or Mono Pass.